Although marketed as a Young Adult book, and about two fifteen year old boys, I would be happy to recommend this for 11+ years. Ivory tells the story of two boys, 100 years apart, who both have a mysterious gift – they draw pictures that tell the future. 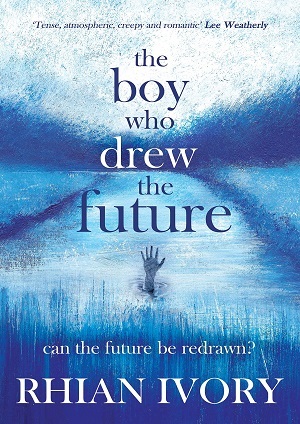 For Noah in contemporary England this is something of a curse – his parents find his ‘gift’ troubling and try to stop it – he too finds it awkward and embarrassing, yet is compelled to draw. For Blaze, in the 1860s, his ‘gift’ is even more dangerous – the threat of being killed for witchcraft is very real. In both her tales, Ivory depicts the conundrum of the teenager brilliantly – the dichotomy of the outsider, the teenager who wants to stand out from the crowd and be special and unique, and yet also wants to fit in and be part of the group. Alternate chapters tell the story of Noah and Blaze from the first person narrative perspective, stepping inside the teenagers’ heads. The tension builds throughout the novel as Noah is desperate to share the secret of his gift with Beth, a new friend; and Blaze moves closer to danger with every new fortune he tells. For me, the boys’ gift worked almost like a modern-day superpower – it enables the character to transcend and rebel against the constraints and powerlessness of childhood. The two stories are linked by geography as well as the boys’ gift, and the reader is left to tie up the strands between the two. The story is sad and poignant and the characters are beautifully drawn. Noah’s burgeoning romance with Beth is told with delicacy, and his relationship with his parents and their past is stunningly depicted – I can’t give away more. Blaze is parentless and friendless, contrasting sharply with Noah, but he has an incredibly moving relationship with his dog. This is great historical fiction for children. It drips information about the past so that the reader hardly realises how much history they are absorbing. It is subtle and fascinating. The stories of the past tie themselves to the present; remaining relevant, interesting and in some cases life-changing. A compelling read that works across genders and up the age scale. Some of the dialogue doesn’t ring as true as it should, but the story is so gripping, you’ll be transported to another place and time with ease. To buy a copy, and I recommend you do, click here. I reviewed an uncorrected proof version of this title.